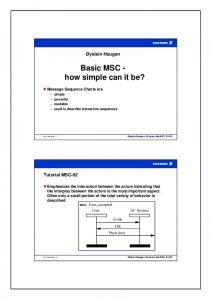 Basic MSC - how simple can it be? Quality in collections - can it be measured, and how? Person-Centred Leadership. What is it, and how can it be developed? What is gatekeeping? Who does it? How is it done? Who is affected? What is the ITCZ, and how can I see it? What is a Wiki, and How Can it be Used in Resident Education? What is Acceptable Variation in the Nutrition Program and How Can It Be Managed? Auditing the ERM Process What Does It Mean and How Is It Done? Preeclampsia Maternal Morbidity: How Can It Be Reduced? Test Center of Excellence How can it be set up?  Supply-side substitution = ability and incentive for firms located elsewhere to find marketing channels, utilise spare capacity or switch production in the short term? Questions posed by the Commission for this project  Does the Commission use the right methodology in its GMD? In particular, should a wider supply-side analysis be used?  Does the Commission appropriately incorporate constraints from outside the GM in its competitive analysis? The Commission’s GMDs are generally well-evidenced and broadly in line with the approach set out in the Notice  Wide range of evidence sometimes used, but Commission and parties appropriately prioritise resources to key issues Effort also limited by data availability  For several of cases, responses to market investigation do provide the bulk of the evidence, but no evidence of Commission being persuaded by self-serving responses  Where statistical and economic evidence is used, it is not the sole decisive evidence, but part of a rounded and holistic assessment Some repetition of evidence between market definition and competitive assessment  Reflects: some unavoidable overlap in analysis; presentation of evidence by parties  Also some lack of clarity re supply-side substitution arguments? Commission should feel free to postpone discussion of evidence until the competitive assessment, if this is more appropriate….  Notice does not envisage widening of the GM to include the source of imports ..or of potential imports Nor should it! Suppose alternatively that the 2 EEA firms each have 1/3 share of Chinese sales (competing against only ChinaCo in China) as well as in EEA  GMD should now be global But in such markets, the precise market definition matters less! Report "Geographic Market Definition in EC Merger Control: How it is done and how it can be improved"